While the time you spend in the classroom is important, so is the other time you spend on campus. Whether you live in the Central Campus residence halls or the apartments on West Campus, life here is designed to make you an active part of the Georgia College community. It's a place where you can relax, make friends, and study in peace. This will be your home away from home, and we’re here to make sure you are comfortable, have fun, and make memories that will last a lifetime. At the heart of Georgia College’s Central Campus are seven residence halls that put you in the middle of everything. Not only do you have a spectacular view of the meticulously manicured grounds and historical buildings, but you’re also only minutes away from everything… in case you ever need to make a last-minute dash to class. If apartment living is more your style, The Village Apartments on West Campus has everything you need. Just two miles away from Central Campus, the fully-equipped one-, two- and four-bedroom apartments here are convenient for both undergraduate and graduate students. West Campus is also home to the Wellness & Recreation Center, athletic fields and other facilities. Shuttle service runs regularly between West Campus and Central Campus. The WRC is the place to go to keep your mind, body, and spirit healthy – from sports and recreational activities to health and fitness opportunities, to our Health Services and Counseling Services. 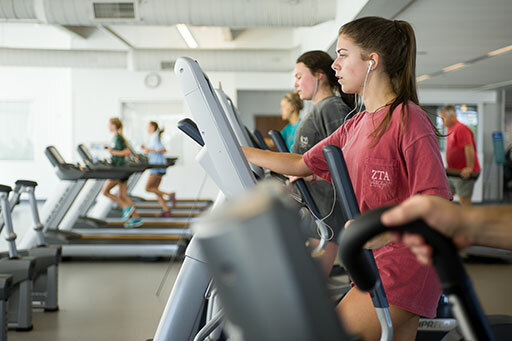 So stop by – and swim, run, bike, dribble, lift, climb, kick, relax, steam, soak - whatever gets you going, you’ll find it here at the Wellness & Recreation Center.